A Tonk's Tail... err, Tale...: The Dog Days are here! I think I'll take it easy on the workout. Wouldn't want to overheat or anything. Allie, you're in air conditioning. Allie, be true to yourself, that's all that matters! Wait, as if any cat could do otherwise...hehehe! 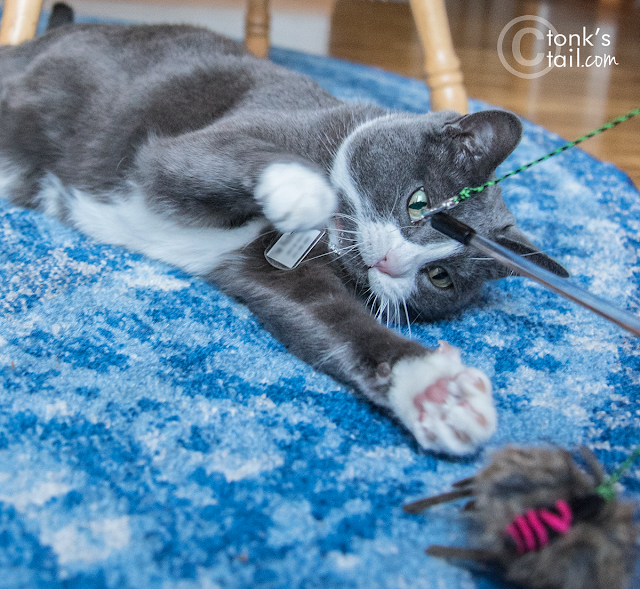 The Neko Fly toys are CB's favorite; he goes bonkers when I bring them out. You’re right, Allie, you don’t wanna over exert yourself, a/c or not. Good idea to pace yourself! Don't worry, Allie, my human can totally relate! Even though we have better air conditioning in our office area now, the hot weather has really zapped her energy. Every day is a dog day at our house, Allie! Kitties should never overexert themselves! You can still over heat if you play hard enuf, even with AC! Hot and humans are not good mixers...hot is the means to make siestas happen!